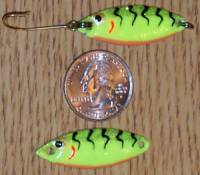 Slightly larger than our Zits jigs, this jig features a #4 Mustad hook. This product has multiple pages. Glow red head, glow white body, black spot, hammered nickel back side. Purple back, yellow center, orange belly stripe, black stripes, gold/black eyespot, hammered nickel backside. This jig does not glow.